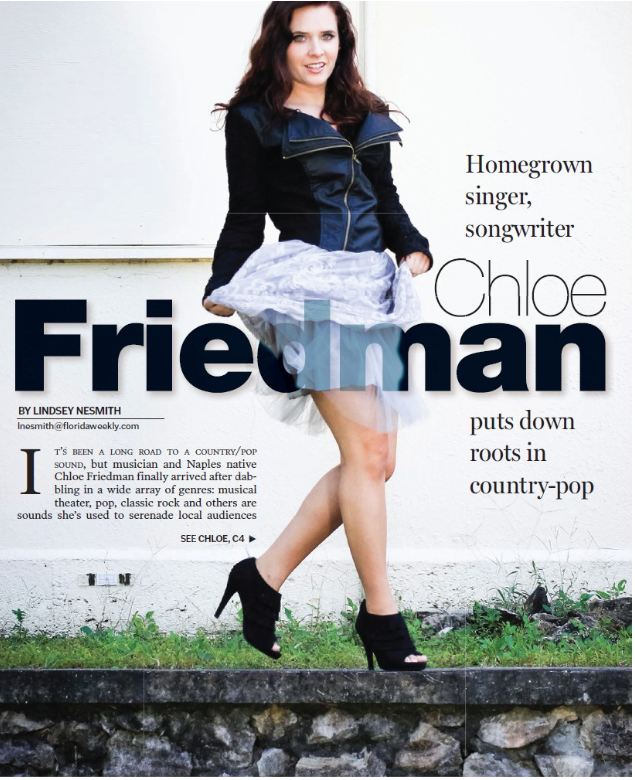 IT’S BEEN A LONG ROAD TO A COUNTRY/POP SOUND, but musician and Naples native Chloe Friedmanfinally arrived after dabbling in a wide array of genres: musical theater, pop, classic rock and others are sounds she’s used to serenade local audiences since she was singing her way through Florida Gulf Coast University. But country stuck for the singer/songwriter, who debuts her third album, “Homegrown” on Friday, June 10, at Momentum Brewhousein Bonita Springs. When she started taking songwriting courses and putting her own thoughts and experiences to music, the storytelling element of country is what kept her strumming and writing, she says. Chloe Friedman, 25, performs at more than 100 shows a year. COURTESY PHOTO“Homegrown,” which was recorded at local studios, is a bit of homage to growing up in Southwest Florida and seeing a different side to the area than many tourists are privy to. For instance, the title track pays tribute to the 13th Avenue beach in Naples and the city’s pier, a beloved hangout for anyone who’s ever grown up here. The talent she’s found at recording studios in the Bonita Springs and Estero areas has been a pleasant surprise, she says, and the studios themselves are like hidden gems. “Homegrown” was recorded at The Live Room, JGM Studios and Trilogy Studios and mastered in Nashville by Malloy Master Tracks Studios. In addition to providing the vocals, Ms. Friedman plays piano and harmonica. Her father accompanies her on guitar and bass. Her first album, “Triple Threat,” was released when she was a teenager and had just discovered the thrill of songwriting. Now 25 years old, as Ms. Friedman has developed as an artist and performer she’s grown more comfortable with herself and her skills, which allows her to take risks. Performing more than 100 shows a year for private parties and at public venues, including gigs to put herself through Florida Gulf Coast University, certainly helped hone those chops. Although she works full time in marketing, she still performs a wide array of genres and is currently contracted for an eight-show series in partnership with Gator Country at Old Naples All American Sports Grill through July 9. She also considers herself lucky to be able to perform her own compositions as often as she does. “I’ve been very fortunate to play a lot of my original music,” she says. “That’s probably the most exciting thing for me.” Her key performances over the years include opening for John Ondrasik of Five for Fighting and joining the lineup of songwriters in the 2014 and 2015 Island Hopper Songwriters Festivals organized by the Lee County Visitor & Convention Bureau and presented in Sanibel-Captiva, Fort Myers Beach and Fort Myers by BMI Nashville and Cat Country 107.1. The release party for “Homegrown” takes place from 6-9 p.m. Friday, June 10, at Momentum Brewhouse in Bonita Springs. Ms. Friedman will sing selections from the album, and guest artists include Brandan James and DJ JayM will also perform. Admission is free and copies of “Homegrown” will be available for purchase.